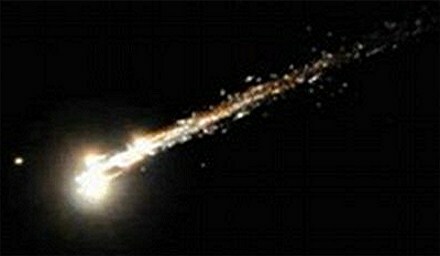 I was lucky enough to witness the strange fireball in the sky at about 11pm last night, Friday 21 September 2012. It was certainly a spectacular, and initially puzzling, sight – but I don’t think it can be called a meteor shower, and I’m pretty sure it could not have been a man-made object. Here’s why. I had just parked the car, to collect my son from a party, when I glanced upwards and noticed what at first looked like a firework. Travelling horizontally, right to left, it emitted a shower of golden sparks in just the way that decent firework rockets do. Given the time, 11pm, I thought that was exactly what it was – some minor celebration somewhere, or some high jinks from local youths. Almost immediately it became clear that this was not the case. It was long-lasting, and it was getting bigger rather than smaller. I rolled the window down to get a better look, then opened the door and stepped out, and still the object was traversing the sky. It was also breaking up. A firework generates sparks that die away, but these sparks were dividing into other sparks which travelled parallel to the general mass of the object. I watched it for about 30 seconds, gradually realising that this was something unusual, and had time to attempt to take a picture. Between looking up the object, and looking down at my phone, I didn’t quite manage to get it into camera mode before losing sight of the object. I was trying to process what I had seen. My initial thought was that it was an object breaking up – the pattern, speed, and duration of the event reminded me strongly of the break-up of the Space Shuttle Columbia in 2003, and I feared it might be an aircraft being destroyed. But any Lockerbie-type disaster would have sent debris downwards, and the objects I saw were still going more or less horizontally. It was clear this thing was very high up in the atmosphere. Its direction of travel must rule out a man-made object. I was looking north, and the thing was going right to left – ie, east to west. Jupiter was prominent in the lower eastern sky, and marked the approximate point of origin. Satellites generally go the other way, taking advantage of the Earth’s rotation. It was too far north to be the International Space Station, which I’ve seen several times and which is always in the southern sky from these latitudes, and anyway the ISS orbits to the east. The duration of the display meant that if this was a man-made object, it must have been a big one. Such a big object, travelling in a retrograde orbit, would have been enormously expensive to launch. Some top-secret military platform, possibly, but I suppose that any such thing would be well documented by amateur skywatchers and its connection to the great fireball pointed out by now. Which leaves a meteor as the only plausible explanation. TV and radio quickly started carrying reports of ‘meteor showers’ seen from northern England, Scotland, and Ireland (and even East Anglia). But it wasn’t a shower, it was a single meteor which broke up as it entered the atmosphere. A meteor shower involves hundreds, even thousands, of individual objects and lasts for hours or days. I made several visits outside after seeing the fireball, and saw a couple of ordinary shooting-star type meteors, both on different trajectories to the main event seen earlier. As far as I can tell, there was just this one spectacular object burning up in the high atmosphere. Some meteors are brief flashes, and are over almost as soon as they’re noticed. The Perseids, seen each August, leave famously long-lasting trails of golden sparks – quite similar to last night’s object. So it wasn’t a satellite or a spaceship (at least, not of terrestrial origin), because it was in the wrong part of the sky and going the wrong way. Meteors often travel east-west, because of the direction the earth is travelling through the solar system, so this was, most likely, a larger than usual meteor. But it shouldn’t be called a meteor shower, as it was basically one object. My guess is that its chemistry was similar to the Perseids, based on the similarity of the spark trails it left. I doubt if any parts made it to the surface, and from the trajectory I’d guess they would have landed in the north Atlantic, but it would be excellent to get a fragment in the laboratory to analyse it properly!